DOJ trumpeted its $175/$234m settlement with Wells Fargo as the largest in DOJ history. Sadly it did nothing to provide wronged homeowners with sums equivalent to punitive damages, those intended to reform or deter the defendant and others from engaging in similar wrongful conduct in the future. So what did homeowners get? At best, $15,000. Against which homeowners had about $12,200 in losses directly related to the foreclosure. On top of which was loss of good credit which drives up insurance and other costs. Punitive damages are often calculated at three times the monetary damages, which suggests homeowners should have gotten at least $60,000. But hey, Eric Holder was Wells Fargo’s lawyer prior to heading up the DOJ, so he was doing a good job for Wells Fargo. Dereliction of Duty, though, when it came to Americans. Read More. Impacts of Foreclosures ~ Read more. Inflation Calculator ~ Read more. 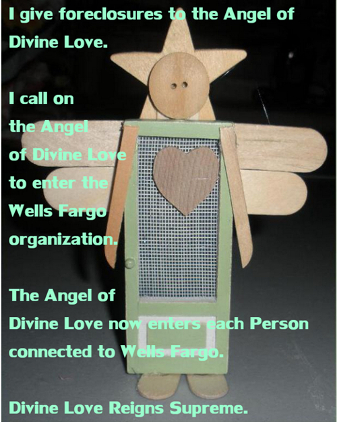 Image Credits ~ Miniature Screen Door Angel by Jim Gatling ~ View site.